Your future is 100 percent in your control! Many people think the future just happens to them or its just luck. Well it doesn’t work that way. A major determinate of your success and happiness is the learned behaviors of your past and how they shape your future. Your past experiences will have a major influence on your emotional reactions, perceptions, and reactions to present events. Your past experiences change the way you look at everything. If you have had positive results in the past in a certain area, you will see yourself achieving positive results in the future. Past failures, anger and resentment can cause you to not take risks, to doubt your abilities and to prevent you from challenging yourself in new areas. The events of your past will have a significant effect on how you see your life now and what you choose to believe about your world. You react to opportunities, success and failure based on what you have learned in life. You don’t see the world as it really is; you see through the eyes of your past experience. The problem with this is often our perception of the past experience is wrong or it will hold us back from trying again in the future. Whenever you are presented with an opportunity, you will have a thought reaction to it. Often, that thought is based on something that has happened to you in the past. When presented with a similar situation later on, your natural impulse is to regard it in a similar way. This can cause you to miss an opportunity or prevent you from believing in yourself. You fail to move forward in your life because you feel you will repeat the past. To prevent this thought process from stopping your growth, you need to replace your negative limiting thoughts with positive possibility thoughts. 1. Change your reaction by changing your thoughts. Make a promise to look at the positive in each opportunity. 2. See your strengths. Focus on your strengths and believe in your ability to succeed. 3. Eliminate negative self-talk and negative self-image. Pledge to no longer think and talk negatively about yourself. 4. The past was your training ground. Begin to view your past as practice. All athletes fail in practice hundreds of times so they can get it right on game day. Your past setbacks are actually making you stronger and more prepared for your future. 5. Visualize your success. Writing down your goals, ideas and dreams begins to program your subconscious brain to achieve success. Think about being a success and you will walk and talk consistent with that belief. 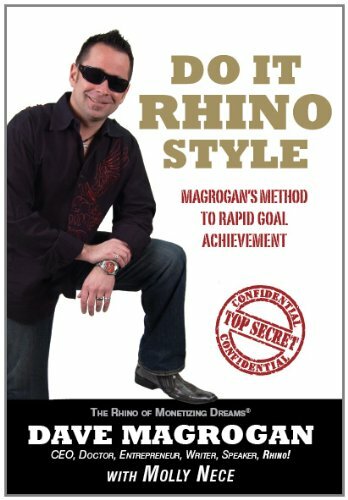 Dave Magrogan is the CEO of Kildare’s Irish Pubs, Doc Magrogan’s Oyster House, Two Men and a Truck Moving Company, and Rhino Living Consulting and Training Group. By clearing the mental clutter, using his subconscious mind, applying the “Laws of the Jungle” and setting big, audacious “Rhino” goals, he has built a 20 million dollar empire in just a few short years! Visit the Rhino Living web page at http://www.rhinoliving.com to find out how Rhino Living can help you!